It seems like forever! The Wizard of Oz has been years in the making. We started planning about five years ago and have been coming up with ideas and gathering supplies for the past few years. Tell us about the Poppy costumes. What did it take to bring this concept to life? 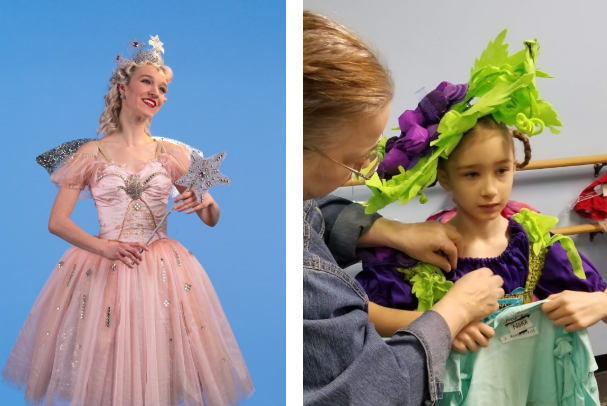 We had to start fitting dancers for the Poppy costumes last season while we were in the theater for A Midsummer Night’s Dream — before we had even announced the show! We had to keep what the “red tutus” were for a secret, and I dodged many questions from those curious dancers! 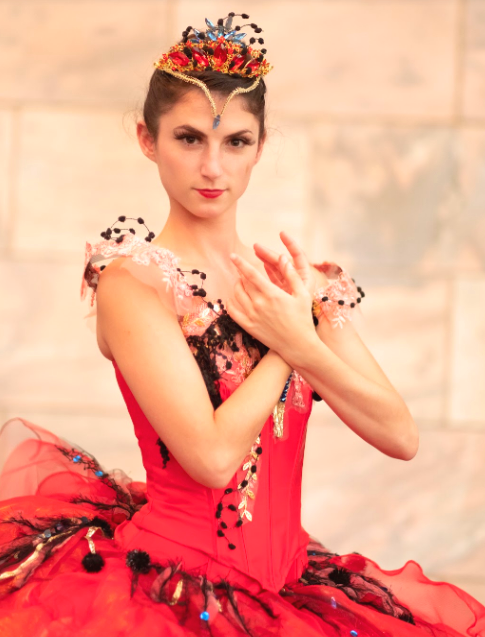 The Poppy costumes are comprised of 20 tutus, fully boned, with elaborate decor and matching headpieces. It took over 900 hand-sewn hook and bar closures to complete the set. A lot of people helped make petals and such during our production weeks backstage. 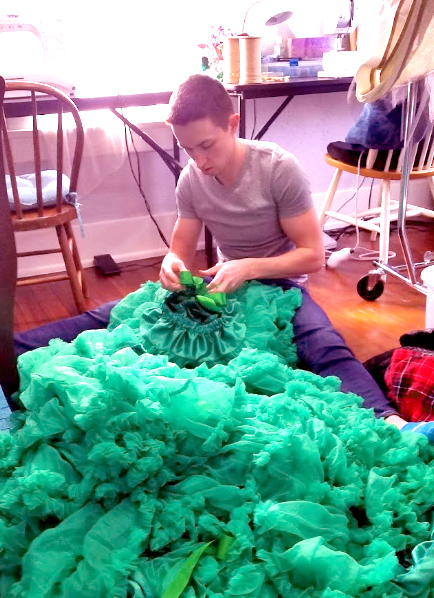 Some of our dancers worked in our costume shop including Wyatt Payne, who spent many many hours on these costumes. Dancer Becca Brenner worked with Wyatt on duplicating the original headpiece. How closely did you collaborate with Erin and Erika in coming up with the concepts for some of the costumes? I always collaborate with the choreographer and artistic director any time I make costumes. The end result is a mesh of all our ideas. Erika (artistic director and Wicked Witch) has her hand in every nook and cranny of every production. I particularly enjoy working with Erin Alarcón (choreographer and Dorothy) because she puts a lot of thought and time into all of her planning, including what she envisions in terms of costumes. I don’t think it’s possible to fully thank Erin for what I know to be endless hours of preparation, thought, and talent wrapped up in a nutshell that is this production of The Wizard of Oz. You’ve told us before that your favorite costume is always what you are working on right now. What is your favorite in this production? My favorite two costumes — because it’s impossible to narrow it down more than that — are the Poppies, evil but tantalizingly beautiful, and the Emerald Courtiers, a vision in sparkling jewels. Nora Carr captures the ‘evil essence’ of the Poppies. Dancer Nora Carr was the original model for the Poppy costume. Company photographer Jim Williams took some photos of Nora in the costume. Nora really captured the evil essence of this role, even though in real life she is as sweet as can be. Oops, I just thought of a third favorite — and that’s Glinda. This costume was fully designed and draped on a dress form without a pattern. It’s a peachy-pink parfait covered in sparkles and sure to satisfy every little girl’s vision of what a ballerina should look like. Where does your inspiration come from for your incredible headpieces? Headpieces are a quintessential element to the full look of a character and as such, they can take longer to make than the actual costume itself. I started on this journey of making The Wizard of Oz costumes with the Munchkin headpieces. In the Land of Oz as I saw it, Munchkins used all the flora and fauna of their surroundings to adorn themselves head to toe. The audience can expect to see flowers, mushrooms, fruits and vegetables, but with the magical touch of the Land of Oz, either giant in form, or vegetables with a floral twist. Each costume in this group has a specific name like Sweet Pea, Carrot Top, and Ruby Tomato. I think this helps the young dancers realize their individual importance to the production. 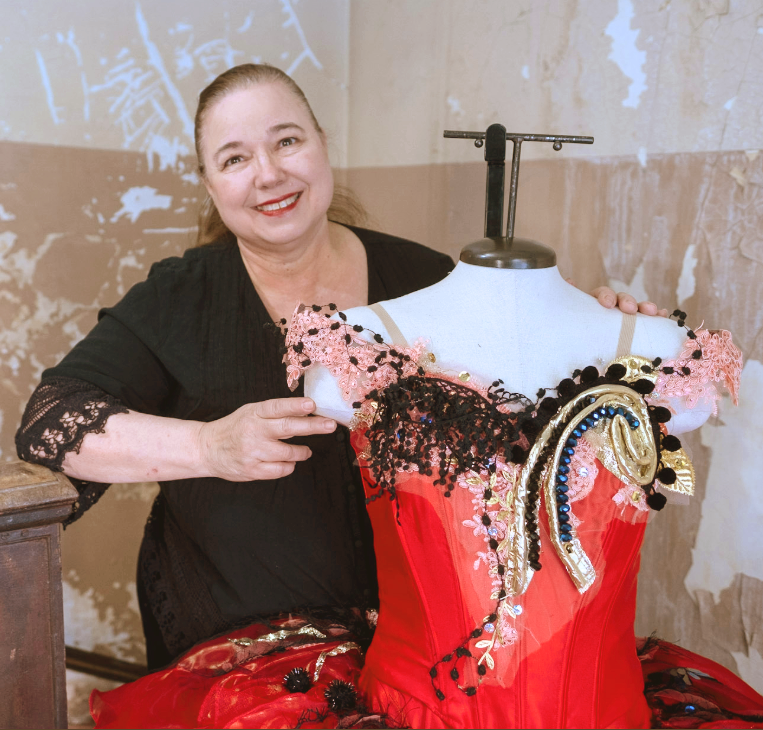 You are particularly skilled at designing stunning flower costumes such as the Waltz of the Flowers costumes in The Nutcracker, and the flower-inspired fairy costumes in A Midsummer Night’s Dream. Would you say this is a specialty of yours? Where does that level of detail come from? Who can do better than the inspiration they find in nature? I often find my inspiration there. I must give a full bow to Kristin Harper, who was instrumental in bringing the Waltz of the Flowers costumes, each one a unique and individualized flower, to full fruition. Tell us about your wardrobe team for this production. How are they helping bring some of these visions to life? 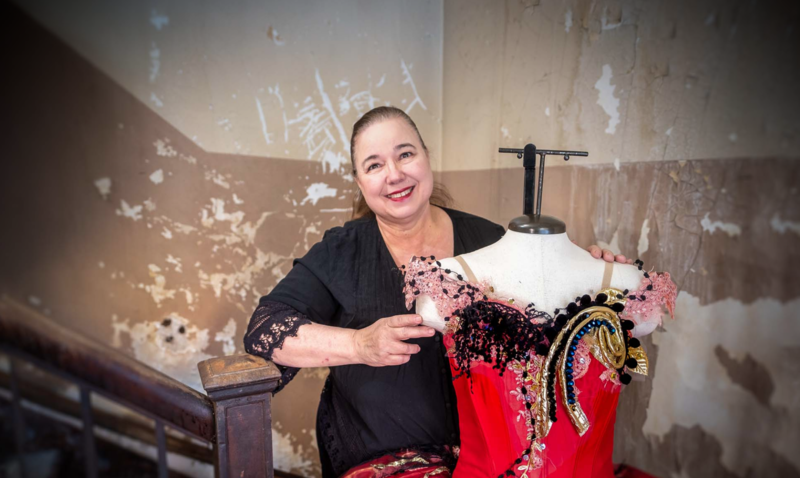 I’m thrilled to work with Amy Voogd, who created the beautiful Emerald Courtier lead women’s costumes that are some of my favorites in the ballet. This year, I was blessed to have a lot of wardrobe support from Wyatt Payne and Hannah Clark on a weekly basis. Becca Brenner worked on a variety of projects along with Shanna Zordell, Katherine Eppink, Katie van der Mars, Kendra Newby, and our intern, Emily Voogd. I’m grateful to Wendy Linville, who has worked with us for the past nine seasons. The incredibly talented Travis Halsey is responsible for the Tin Man, Scarecrow, and Emerald Court men’s costumes. 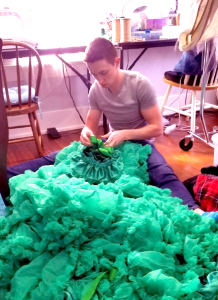 I am grateful for all of the dancers in our company who so graciously step out of their world of dance and into my realm of stitchery when called upon to do so — but especially to dancer Wyatt Payne, who spent nearly 200 hours on his winter break working on costumes. A special shout out to parents of community students who spent hours during production weeks helping push The Wizard of Oz projects forward, including Elizabeth Kittle, who came in multiple days even though her daughter was injured and unable to perform in our last show, and Barb Wilwerding who helped with our massive fitting schedule. Without the help of all of these individuals, The Wizard of Oz costumes would not be finished and onstage for your viewing pleasure this spring. Who are some of the other people that you work with behind-the-scenes to make this production so spectacular? This year, we pulled in an incredible force in scenic design in the form of Bill Van Deest. Normally he and Carol Wisner are responsible for the magnificent lighting design for our shows, but for The Wizard of Oz, Bill contributed the fantastic and enchanting set design creations that are now a permanent part of our collection. After you see The Wizard of Oz, if you like what you saw, thank our production manager Lance Glenn because he puts all of the production elements together and has been doing so since the start of the company. He’s the first and last one on the scene and plays a vital role in making the magic possible. What will the company’s upcoming move to the Hoff Center — and finally having your own on-site costume shop — mean for you and the Wardrobe team? To finally have all of our costumes in one location, with a fully functioning costume shop on the same premises with the dancers, is a dream come true. I am itching to organize all of our racks and shelves of the costume treasures we have accumulated for nearly a decade. What are some design elements we should keep an eye out for during the performances? The colors that were used for Kansas indicate the sad, dreary hopelessness of life’s struggles. In complete juxtaposition to this is the Land of Oz, as colorful as a child’s imagination can make it. Emerald City is as sophisticated and opulent as Kansas is simple and unadorned. Yet in the end, the real treasure, that of love and family, is heartwarmingly portrayed by the dancers themselves. Kansas isn’t so dreary after-all.